You are here: Home>Archive>Taylor Brown Collection.>Marriages.>Marriage licence for Frank H. Brown and Beryl L. Taylor. Marriage licence for Frank H. Brown and Beryl L. Taylor. 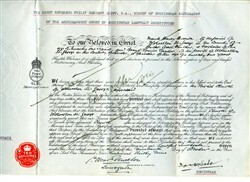 Pale blue marriage licence dated 19.10.1939 between Frank Harry Brown and Beryl Louise Taylor. The writing is in black ink in italic script and the names are written in black. On the left side of the license is an embossed shield with a red ‘ten shillings’ stamp underneath.